Éric Vuillard is a writer and filmmaker born in Lyon in 1968 who has written nine award-winning books, including Conquistadors (winner of the 2010 Prix Ignatius J. Reilly), and La bataille d’Occident and Congo (both of which received the 2012 Prix Franz-Hessel and the 2013 Prix Valery-Larbaud). He won the 2017 Prix Goncourt, France’s most prestigious literary prize, for L’Ordre du Jour. 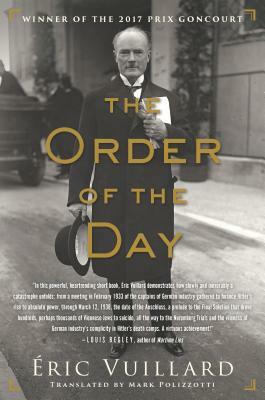 His most recent book, Sorrow of the Earth, was his first published in English; The Order of the Day is his second. He lives in Rennes, France. Mark Polizzotti has translated more than fifty books from the French, including works by Gustave Flaubert, Patrick Modiano, Marguerite Duras, André Breton, and Raymond Roussel. A Chevalier of the Ordre des Arts et des Lettres and the recipient of a 2016 American Academy of Arts & Letters Award for Literature, he is the author of eleven books. He directs the publications program at the Metropolitan Museum of Art in New York.